Indian Man is a rising talent in the DJ and festival world. Spinning Bhangra, Garage and Hip-hop, his tunes symbolise the beats of second generation British Asians. Indian man has played at top festivals including Glastonbury and Womad Chile. 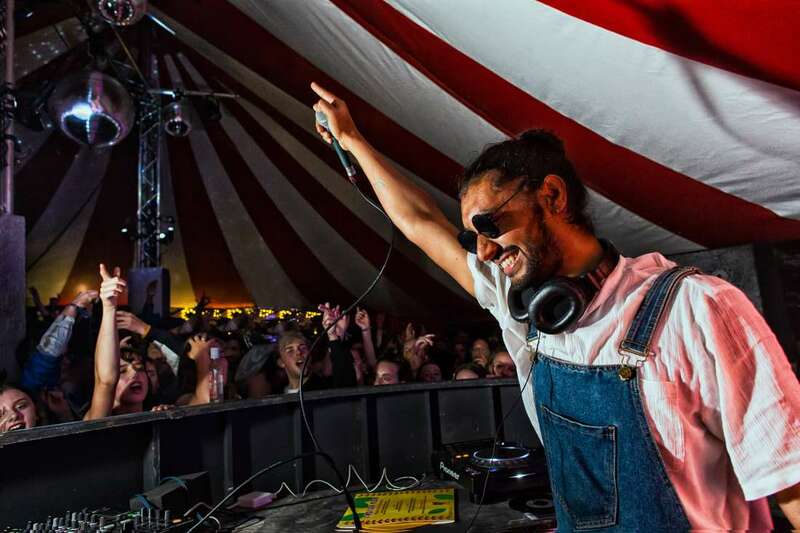 About to DJ Womad UK this summer, his mission has been to bring Urban Bhangra to the masses. However, there is more to this mission. Aashi (Asian Arts Agency) chats to Indian Man on DJ’ing and dreams. When did you first realise that you are a DJ? A really great question! It happened without me knowing. It came from these songs that are really embedded in my childhood. I hear them and something happens inside of me. I wanted to share that feeling with other people. To be honest, it started off just wanting to share that music with people who didn’t know about it and seeing people surprised by these songs that I would play out. I started playing at Glastonbury Festival. That was the one that kicked it off for me. It really, really started as just a bit of fun. Then the next thing I knew I started picking up gigs and became a full time DJ without really knowing. It was a real surprise. What does it feel like when you spin? It’s like an unstoppable feeling. I can’t help but smile and dance. It’s really interesting because I’m trying to bridge that gap between DJ and audience. I often find that the DJ have themselves to themselves and the audience do their own thing. I love the communication between us. Your favourite all time Bhangra track? Oh God – that’s a hard one to say! I think, you know the Safri Boyz? There’s a tune called Chan Mere Makhna. That is the number one track. It’s the wedding song from my uncle, whom I’m very close to. I hear that and – it’s produced so badly. The recording quality is bad but it doesn’t matter – it’s the song. It’s the song. Do you have a song that became a pivotal moment in your life? Yeah, absolutely. There’s a garage tune that’s mixed with Panjabi influences by Panjabi MC called Bheer. When I hear that song, even to this day, it did everything for me to give me my genre of what I perform and what I do. You have had to face family rejection to follow your dreams. How has that shaped you? There’s two ways you can take that you know. You can let it degrade you and un-inspire you. Or you can take that energy, take that feeling and turn it into something. And express it. That’s what I’ve done. I suppose what I’ve come to learn is that it’s not our family’s fault… there’s rejection there but rejection because if you don’t understand something it’s natural to reject it. I love my family regardless. They have traditional views but they are from a place where that happened and that was normal for them when they came to this country. But I think ultimately, I don’t think I could do it without breaking away from that. If you want to go and follow your dreams you have to let go of them. And that’s what I am fighting for – anti-traditionalism. “My message is to say that don’t be afraid to follow your heart and step aside from traditionalist views and do what you love. If you really love it and live it, the world around you will mould and they will understand in time”. We have choice. We really do have choice. You might have to sacrifice a few things to go down that road and it’ll come back to you. I really feel that you know. Now I’m really bringing some traction in that I’m doing things I love. And my family can see that and they are starting to be able to love me for that. Asian Arts Agency supported Indian Man to attend Womex 2017. Find out which new projects this led to for Indian Man. Click here to find out more about Indian Man.